Last month I was teaching at Central Market, a chain of pretty amazing supermarkets in Texas that has just about anything you can imagine—including cooking classes. And I never pass up the chance to teach there. For one thing, the staff is uniformly excellent and it’s just a pleasure to step into their kitchens and work with them. But the other is that I get to wander the aisles of their supermarkets, which are like no other in the world. When they invited me to come, they said; “By the way, we’re having a Citrus Festival. Would you like to participate and do desserts with some of the citrus we’ll be stocking? 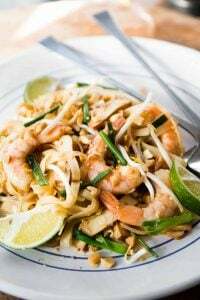 We’ll send you a list so can decide.” And when I opened up that spreadsheet and saw everything from Rangpur Limes to fresh Yuzu, I couldn’t say yes fast enough. Nowadays blood oranges are grown in California and elsewhere, and are fairly easy to find in the states. The most common varieties are Sanguinelli, Tarocco, and Moro, the latter having the deepest red color of all the blood oranges. Blood oranges have a distinct berry-like concentrated flavor, although some varieties are juicier and sweeter than others. In France and Italy, one can find blood orange juice commercially available in supermarkets. Navel oranges are widely grown and I eat one a day in the winter. (Some people forget that winter is citrus season in the northern hemisphere.) A favorite mid-morning snack is a bowl of orange sections and pieces of dates, which is a great combination. Or top slices of oranges with pistachios or pistachio oil, adding a dusting of cinnamon—and perhaps a scoop of blood orange sorbet or crème fraîche ice cream, for a quick dessert. When you buy one navel orange, you’re actually buying two. The “navel” of the orange is actually another orange growing inside the fruit. In the excellent book Oranges by John McPhee, he reminds us that all navel oranges were likely cultivated off one single tree in Brazil. His book also tells the fascinating story of frozen orange juice and it’s a must read, even if you don’t think that you care all that much about oranges. Navel’s don’t yield the most juice of all the oranges but are great for fruit salads since they’re meaty, sweet-tangy, and of course, have no pesky seeds. 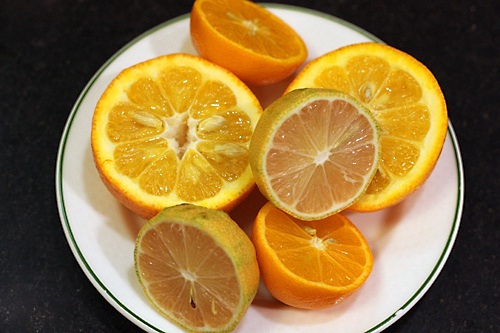 If you can find them, Cara Cara oranges have sections that are vivid pink-orange and are wonderfully flavorful. I would love to get my hands on some. 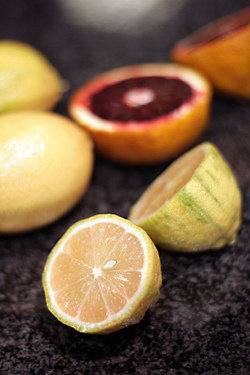 Another citrus shocker are pink variegated lemons, which when sliced open, reveal a soft-colored interior whose perky scent is instantly reminiscent of fresh lemonade. I think if I had space for just one citrus tree (not a chance in a two-room apartment), this would be the one I would plant because I find them so intriguing and versatile. The juice is sweet and pink when squeezed, which I have no doubt I’d find plenty of uses for, sweet or savory. Grapefruits are widely considered to be a cross between a pomelo (sometimes spelled pummelo) and possibly an orange. 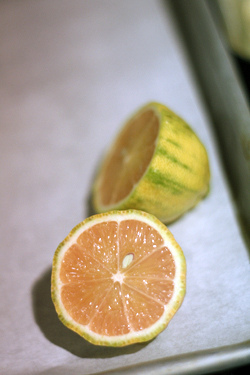 Pomelos are the largest of all citrus and can reach the size of a bowling ball. They appear in markets in January to coincide with Chinese New Year, when they are enjoyed for good luck. Stems and leaves attached signify abundance. Pomelos are best peeled and eaten as one would a giant orange. 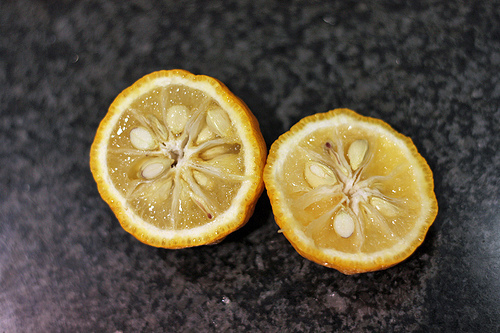 Like grapefruits, the rather thick skins can be candied but needs to be blanched in several changes of water to reduce their bitterness. Citrons are a fruit that really is best enjoyed candied. 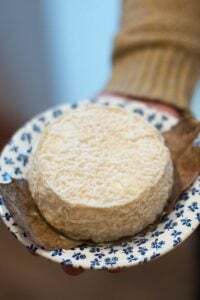 Although in Italy I’ve heard they slice them raw and serve them sprinkled with salt, the idea in my head isn’t all that appealing—although I’m happy to be proved wrong if someone wants to spring for a tasting trip to Italy to sample it. Citrons were one of the first citrus fruits to come to Europe, and nowadays there’s a lot of confusion over the names; in France citron means “lemon” and cédrat is a citron. 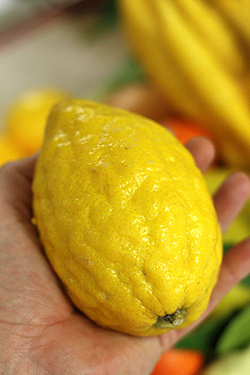 In Italy, it’s a cedro whereas a lemon is a limone. 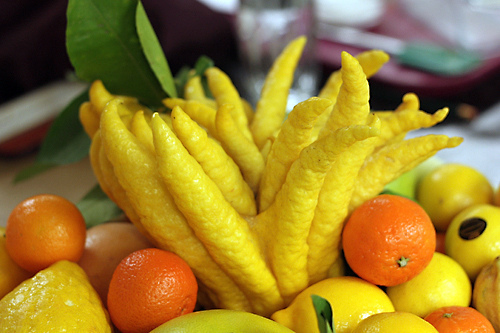 The two types of citrons most common are the Etrog or Esrog, (above, left) and the wild-looking Buddha’s Hand, (above, right), which has tentacles that can splay out in all directions. Most citrons have little or no pulp inside and the entire fruit is preserved or candied in pieces, or in larger quarters or strips. Even the experts aren’t sure if the Meyer lemon is a cross between lemons and oranges or mandarins, but everyone agrees they’re softer and sweeter than ordinary lemons. 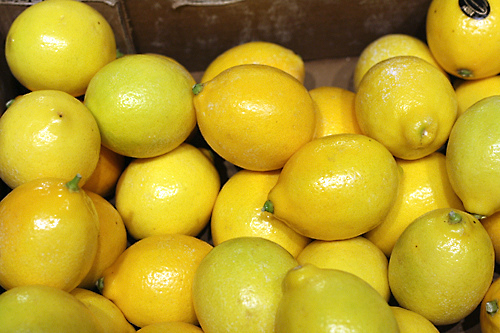 Because they’re more fragile than regular lemons, they’re usually not available commercially and if you know someone with a tree, it’s likely you’ll get gifted some Meyer lemons during the winter. 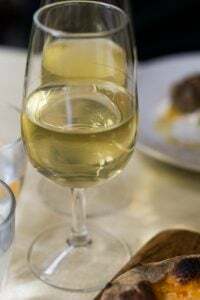 Their juice is quite sweet, albeit delicious, and if you use it in recipes calling for standard lemon juice (usually Eureka or Lisbon lemons), you’ll need to at least double the amount of juice or dial down the sugar. Most limes aren’t green when ripe; commercial limes are gassed when they’re unripe to ‘fix’ their color. That’s another reason why commercial limes don’t yield as much juice as their riper counterparts. If you travel to Mexico or Asian countries, or shop in Latin or Asian markets, you’ll see yellow sweet limes, sometimes referred to as golden limes. Whatever kind of limes or lemons you buy, look for glossy fruits which indicate ripeness. One fruit I was particularly excited about using during my classes was Yuzu, which has become a somewhat trendy ingredients in Paris restaurants and elsewhere, and the juice is sold in small bottles in Japanese markets. That’s partially because each Yuzu has lots of seeds and very little juice. So next time you see the price of a bottle of the juice, the faible amount of juice each fruit yields justifies the price. The scent is a bit mysterious; kind of balmy with a complex musky-citrusy scent. When I sent a picture of one over Twitter from the class (no, I didn’t stop the class to do it, but I couldn’t believe it when I saw my first-ever yuzu, and waited for the break to share it), someone pointed out that in Japanese markets in Los Angeles they sell yuzu for about $9 each. Speaking of balmy/musky, those tiny tangerine-like fruits holding up the citron are Rangpur limes, thought to be a cross between a lemon and an orange. They’re a bit too musky for my taste, but they’re fun to pull out and tell people they’re limes. Even if technically speaking, they’re not. 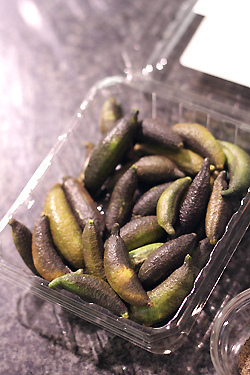 Another oddity in the citrus world are finger limes, each the size of a cornichon pickle. But cut one open, and you’ll find they’re filled with tiny, separate pieces that spill out and crunch like caviar and spritz and spray the inside of your mouth with tangy lime juice. They’re really good, and who knew they could be candied? Kumquats raise controversy as some feel they aren’t citrus fruits (Walter Swingle, a botanist, reclassified them as Fortunella in 1915, although people still incorrectly refer to them as citrus fruit), and kumquats are often hybridized. 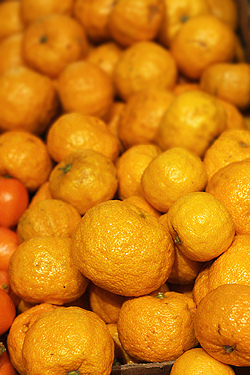 Hence you’ll find fruits like mandarinquats (above, left), limequats, lemonquats, mandarinquats, and citrangequats. Calamondin are larger fruits believed to be a natural hybrid. Kumquats are eaten whole or sliced, and the most of us eat the multitude of seeds inside. 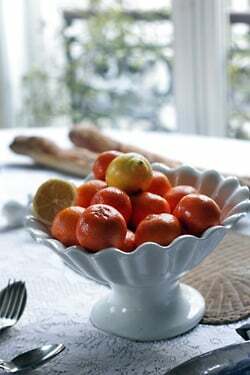 Kumquats, and their hybrids, are ideal candidates for candying and preserving because they’re quite tart, which is a nice contrast to the sweeteners used when candying. Candied kumquats are marvelous with poached prunes. You may not have access to a bounty of citrus like this, but local farmer’s markets can yield unexpected surprises during citrus season. Many of the oddest or more interesting varieties of citrus don’t make it into supermarkets or grocery stores because there isn’t the demand. Aside from jam making, citrus fruits are good for candying, making sorbets, and cocktails such as Sidecars and Margaritas. 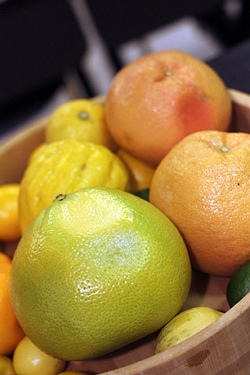 Citrus should be stored in the refrigerator if not to be used within a day. 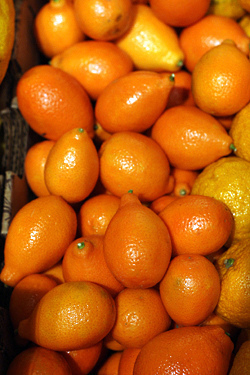 Do not store citrus in plastic bags as the condensation and humidity will cause the fruit to degenerate quicker. Room temperature fruits yield the most juice so if you plan to juice the fruits, allow them sufficient time out of the refrigerator. Some people microwave the fruits briefly to speed up the process. When buying citrus, looks can be deceiving. The color of the skin isn’t all that important and fruit that appears mottled or green can actually be quite sweet and brilliantly colored inside. Fruits that stay on the trees longer, like honey tangerines (which usually have very rough-looking skin) are the juiciest and sweetest. Most people reach for the plumpest grapefruit but the ones that appear slightly flattened tend to be the ripest and the sweetest. At the market, if you can pick up each piece of fruit; the heaviest ones have the most juice. If they’re offering samples, that’s a good chance to taste some varieties new to you or reacquaint yourself with some familiar ones. Is American Food Better Than French? As someone whose main ambition on living in Spain is to grow my own lemons, I can understand the excitement! I’m looking forward to making Lemon Meringue Pie with my own lemons later in the year. I’ve got 20 or so on the tree now, so yippee! I was devastated a couple of years ago, when all the tiny lemons I had on it were lost when the weather got nasty. I’d recognize that last Buddha’s hand, anywhere. That was the one from the Austin class. It looks like Bart Simpson’s head more than Buddha’s hand. It’s always nice to hear you sing the praises of my favorite grocery store. Not being a world traveler myself, it’s also nice to now that one of the best stores a traveler like you has come across is in my own backyard. Thanks for visiting us and for the write up. I can’t wait for your next visit. I have never heard of some of these types of citrus fruits before – a fun post! David you write so well – you make everthing more interesting and you always have facts that no one else writes about. Thank you – and your sense of humor is fabulous! I think I see one of my favorite tangerines in the edge of one of the pics: Pixie tangerines. They are really tangy and easy to peel. They look wrinkled and terrible on the outside but are sweet on the inside. This is really interesting reading! I never knew the details on a number of these fruits, much less tried them. I love blood oranges, though, and I’m currently obsessed with Cara Caras. It helps that they are selling for a phenomenal price in Western Pennsylvania right now too. I’ll send you some, David! Grapefruit is by far my favourite of the bunch. I love finding new recipes and cooking with it. Without you, I would have never known there were so many different types of citrus. Very interesting. Thanks for the tip on picking sweet grapefruits. I’m eating one this morning that is sour as a lemon. Slightly flattened will be what I’ll look for next time. That Central Market is truly amazing. How lucky to live near there. I subscribed to their newsletter so I can see what I’m missing out on in Maryland. I have been to Japan for a few times and ate some Yuzu dishes there, it has a nice sweet floral aroma to it. Sudachi is my favorite though, the juice is more aromatic while for Yuzus the juice is kind of pale in comparison to the zest. I can’t believe a market in TX offered all of that!! It’s like my own personal citrus heaven!! I would love to find yuzu, as well as a golden lime to see what I’ve been missing eating gassed limes from the grocery store all these years. 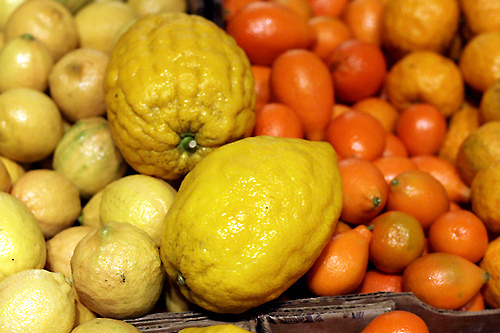 I love that citrus fruits are in season over the winter– brightens up the otherwise dreary weather. Looking at your citrus photos is almost as good as seeing the sun bright in the sky! Almost. I long for Spring! Off to see if my dwarf citrus has a ripe Meyer Lemon for me! Vicki: That mustard is really good and I believe that last one in France to use spices only grown here in France (most of the others use spices from Canada, even if they say “Made in France.”) Someday I plan to visit them just to see how it’s made. Shirley: Central Market is pretty special and it’s not a ritzy place, but more of an everyday market, which adds to its appeal. I keep lobbying for them to open in Paris, and once they do, I’ll put in a good word for Singapore! 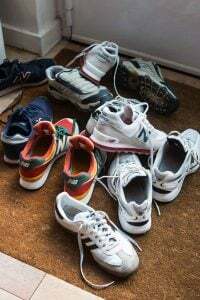 Vicki: I really do love going there and while they do hire me to teach classes, don’t tell them, but I think I would go for free just to wander the aisles and check out everything they have. Elisa: Surprised that Cara Cara’s are so expensive since I think Sunkist is growing them on a fairly wide scale. But the good thing is that you can buy just a couple (like most citrus) and be pretty satisfied. What a fantastic run-down on the citrus families. I’ll be picking up that book about oranges too – who doesn’t love some random fruit facts? I really want to visit this market in Texas now, but it’s so far away. I like adding the juice of half an orange into my tea with a little bit of honey. It’s a nice change from lemon. I grew up in Central Florida, so of course orange and grapefruit trees were abundant, as well as kumquat trees (there was also something called a loquat). But it’s always been my dream to have a lemon tree, especially now that I live in New England. I never knew until recently that Florida oranges are really only used for making orange juice (commercially, that is – we always ate what grew on our trees). 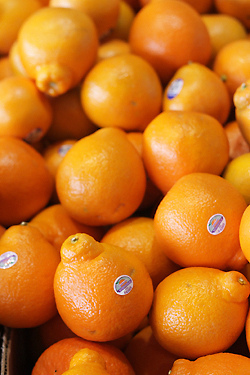 The oranges sold for eating around the US are all from California. Did they have sweet limes like they have in India? I miss those so much. I’ve tried getting them here in NY and they just aren’t the same – not juicy at all – just dry and bitter. Such a shame. I loved the sweet lime sodas there. I live in Austin, and love Central Market. I too have been terrified by the MagicPop machine!! don’t you just love Central Market? It’s one of the things I miss most about living in Dallas. Your photos are just stunning! Just finished licking my fingers from the Texas grapefruit breakfast I had this AM. I am a glutton for good citrus, so it’s no surprise that this is my favorite produce time of the year! For my money, finger limes don’t need to be candied to be candy for me. Thanks for the wonderful write up on my favorite local store and my favorite fruit genus. Hope to catch a class next time you are in Texas! I just happened to be eating temple oranges from Fla as I read this post. 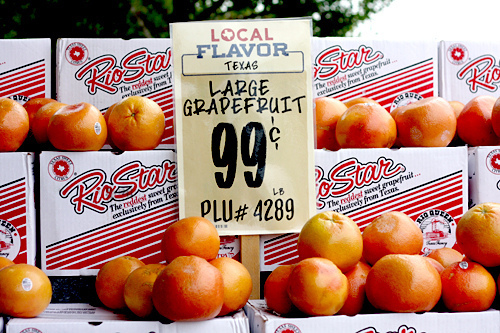 One reason I look forward to winter is the never ending abundance of Pink Grapefruit, mostly from Texas I think. I can’t get enough of them and would be embarrassed to say how many I can consume in a week. Great and interesting post. 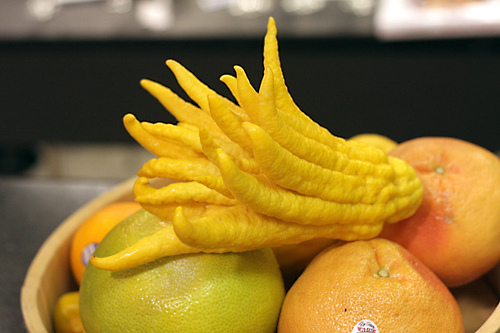 I once purchased the buddha’s hand at Fairway for its visual beauty; but none of the store clerks were able to identify what it actually was (this was about 6 yrs ago). I did taste it but didn’t know what to do with it…now I know. David, I am SO JEALOUS. I lived in Austin, Texas for ten years. We lived a few blocks from the Central Market so we did our daily shopping there. Do they still have the bulk foods ‘wall of candy?’ Or the ‘wall of chocolate’ by the exit to the checkout counter? If you have the time, be sure to explore the city. It’s fantastic and my son and I have fond memories of the place. What beautiful photos! And a tremendously interesting post. Thanks! Whenever I read one of your posts I instantly want to jump in the car and drive to Berkeley. Thanks David-this article is rather timely. Although I live in Vancouver, British Columbia our supermarkets here are full of gorgeous citrus this time of year. Surprisingly, the prices are just as good as California prices. Blood oranges, Meyer lemons, Cara Cara, you name it even Buddha’s Hand which I had seen in Kuala Lumpur and in San Diego markets but only found it here last January at Whole Foods. Have not seen finger limes yet. Thanks also for the links. I suggest that your readers take a gander at the link to the UC Riverside Citrus Research Collection. Next time I am in San Diego I am definitely going to take a trip up there. How exciting to see such a huge collection of citrus all on one site. I have been making Meyer lemon and blood orange sorbet and granita, blood orange olive oil cake (from Melissa Clark) and of course lots of curd and candied peel. Nothing better than a piece of almond or citrus cake with a citrus compote and a side of lemon curd! Thanks so much for all the info! It is hard sometimes to get excited about winter’s bounty of fruits and veggies since it is a little limited, but I always look forward to all the wonderful citrus fruits. I just made some blood orange curd for a tart that was amazing! Now I REALLY will miss citrus season when it’s gone. Beautiful images as usual! This was fantastic! I’m loving the citrus in SoCal right now…2 or 3 a day for sure! My farmboxes come with the most delectable citrus inside these days. Good to know the tip about the fridge…all mine will go in posthaste! Love my Meyer lemon tree too…can’t wait til it’s a little bigger and yields a bit more than 5 or 6 a year! Central Market is the best and yes the magic pop machine will definitely catch your attention!!!! We just had some blood oranges last night. Delicious!!!!! Such an informative post. I have a Meyer Lemon tree, and a navel orange tree. This gave me lots of ideas of what to do with them, and also opened my eyes to the extensive other varieties around. I will try Cara-Cara next time I see it. A grapefruit is ripe when it has tiny black speckles on the skin, and it’s heavy, but slightly flattened means it just sat at the bottom of a 4′ x 4′ x 4′ bin of other grapefruits. It will be incredibly sweet too when it’s ripe, but it’s almost impossible to find such in the stores in the US. I used to pick citrus, and it’s clipped off the tree, which leaves a tiny bit of stem, and not picked ripe. If you can easily flick out the stem, it’s probably almost ripe. Thanks for replying, David! I meant *phenomenally* low price here, and they’re even on sale this week. I love citrus fruits in the winter. I am now obsessed with finding citron in the D.C. area. 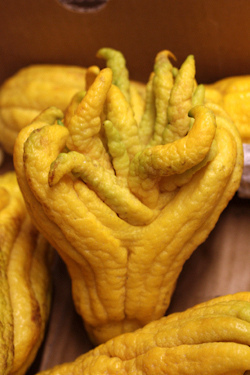 The Buddha’s hand, especially, fascinates me. We love navel oranges too. One of the things I miss most about living in Florida (um, aside from my family) is fresh Key limes. They’re so delicate and pale yellow and have this absolutley gorgeous, almost spicy aroma that makes them invaluable in cooking. I can’t stand the miniature sprayed Mexican limes that are marketed as Key limes here in Texas. (Although I did get my hands on a few yuzu last week, so there is a tradeoff.) I can still make a lime pie with the Mexican limes (or the big Persian ones, for that matter) but to me it seems a lot of flavor is lost. Yes, I was just gifted a bag of Meyer lemons recently because I don’t have my own tree yet. I need to get on that! 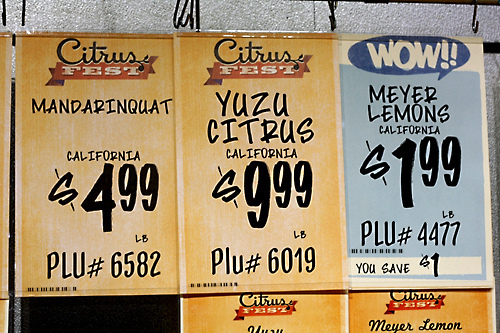 What a great list of citrus — there were some I’ve never heard of before. That market sounds like Food Heaven! Love the photo of the buddha’s hand! My favorite post EVER from you….my favorite thing is citrus…just love it! Love this post! Very timely, as I’ve recently been buying oranges from groves in Florida that will ship them; you know, like grandma and grandpa used to send back home to us when they wintered in Florida. I bought some at the grocery store to compare, just to be sure they were worth the money, and boy howdy, what a difference. The grocery store oranges were dry and bland. And of course the only variety they have is navel. Wow David! Thanks for the fantastic lesson on citrus! When people say chocolate or vanilla, I often respond citrus, because I love the flavor so much. I have two Meyer lemon trees that are full of fruit right now, a navel orange with tons of oranges and a young Moro blood orange that is young and not producing much as of yet. I smile every time I pick fruit off the tree, knowing i am lucky to have these treasures in my yard. That store must be amazing and you obviously had a ball. David, thanks for the citrus tutorial – it is most interesting and educational – have to say that at almost 89 I’ve been exposed to fruits I had no idea existed. Now I have to get to the farmers market here in Raleigh and see what they have – the Meyer lemons are almost a mainstay at Whole Foods fortunately because I truly enjoy them. Who knew I could be so enthralled by citrus? I now want to read citrus books! As I woke up to air temperature of minus 15 degrees F (we don’t discuss windchill), the only upside about winter is indeed citrus. Grand, vitamin C-laden post! What a wonderful celebration of citrus! On the Meyer Lemons: I have a tree and I’ve discovered that, like limes, if you pick them green they have an entirely different (but equally great) flavour. Much more acid, too. And on Finger Limes (they’re a native Australian bushfood that’s been recently hybridized): Those little citrus bubbles are pretty magical in a margarita! I live in Florida & would recommend Indian River grapefruit as some of the sweetest grapefruit you can buy. Grapefruit is picked when it meets Florida state standards for juice & sugar and will not ripen further once it is picked. You want to select a grapefruit that is firm, not soft, and more flat on the ends, not “nosey” and heavy, meaning it has more juice. 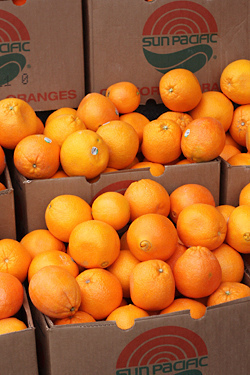 Florida’s oranges are sold fresh, although most of them go to the cannery to be juiced. 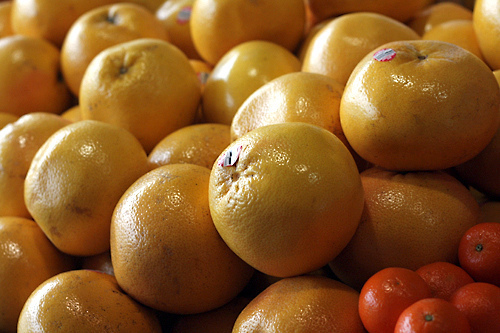 Winter is the season for Florida citrus unlike California which produces year round. Enjoyed your informative article, as always. This is a wonderful post full of information that I know I’ll re-read. I am so glad that you love Central Market – as that ensures us that you will return. And yes it really is one of the best stores under one roof. After your Citron post the other day I trudged out looking for one to make my mom your candied citron recipe, but I think I was too late. There were none to be had at Central Market or Whole Foods, but I’ll keep looking. I’m really enjoying “The Sweet Life”, and my husband is forever asking me what I’m laughing about ‘this time’. Love the mint ice cream in the toilet story. I’m savoring the read. I don’t want it to end. John McPhee is a wonderful writer, isn’t he? Have you read his book “Annals of the Former World?” He makes geology completely fascinating, especially the part about California’s slippery position. Cara Cara oranges are really expensive here, too, but I agree they are great tasting. Confession: I am training for a marathon, and on long runs I often pick an orange or tangerine from someone’s yard and eat it during my run. RST and Jean: Yes, I’ve always found (and heard) that grapefruits with flatter ends means they are riper. A grower in Florida wrote a bit more about grapefruit ripeness and what to look for, noting flat bottoms & top. But as someone who has picked them professionally and lived around them, you likely can tell by instinct which fruit is best just by hefting and eyeing them. The Good Soup: Those finger limes are lovely. They’re pretty expensive in the states (I have not seen them in France) but popping a few in a margarita sounds really terrific. KosherCorvid: I used to get real key limes from someone with a few trees in San Diego (and those little limes were tiny..) and the limes they usually sell as “key limes” just aren’t the same thing. Love this post David! I live in the Netherlands and the only ID on any fruit is its country of origin. It’s the same in supermarkets or the big Middle Eastern open-air markets….no info whatsoever. Am jealous that all of you get so many choices. We don’t have half of what you get to pick from. Eet smakelijk! Lots of good information about citrus. Wish we had a market like Central here in Miami. Fresh Market is about the best we have, but doesn’t come close. As for John McPhee, he is one of the greatest living non-fiction writers we have today. 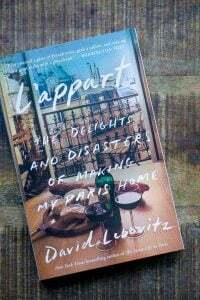 He can write about wallpaper and make it a fascinating read. Fantastically done post, David! I’m on my way to Tang Frères this afternoon and hope to pick up a Pomelo (or two) and have my own Year of the Rabbit Chinese New Year celebration. 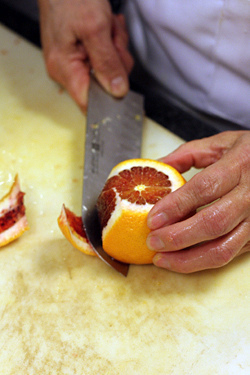 Thanks for the tip on how best to eat as one might consider cutting like a grapefruit. 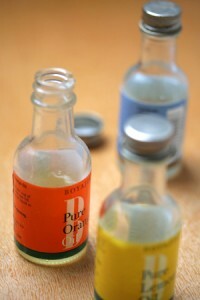 Now….could you provide us with some links to citrus recipes ;-) ? My sister told me I should write about lemons, everyone loves lemons, especially in the middle of the winter, she said. I tried to tell her that citrus fruits don’t actually grow much in Provence as the winters are too cold, anyway, so now I can send her your piece instead! If you ever get the pleasure of visiting Australia you must seek out and taste the wonderful Australian Desert Lime. It is a small native fruit that is no bigger than the tip of your thumb, and it has a strong “morish” flavour that is simply devine. The skin is thin and soft so you can cook them whole and preserve them, then eat them with vanilla ice cream. I have several native lime plants and I mix three of them together and make my own lime marmalade which I call, “Wild Lime Marmalade”. 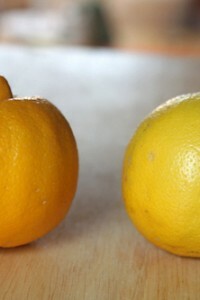 I never imagined I could be so fascinated by a post on citrus fruit! Most of the fruits I have never even heard of, or seen in any shops! The supermarkets generally only sell oranges, mandarins, grapefruits and lemons and limes here in Holland. I have found more exotic citrus fruits at small grocers and tropical shops though. Unfortunately mandarin season is already over, but starting October until December I eat so many mandarins that I can’t believe I don’t turn orange haha! Angela: I thought there was some beautiful citrus in Provence, but I guess parts of it get too cold. I know there’s those Menton lemons, but I am sure a lot of the odder things (like golden limes and citrons) are difficult to sleuth out. Debbie: It can be hard to find specialty citrus in Northern Europe, although I’ve had pretty good luck at health food stores and places like that. Although not ideal, I have found sources online as well for things like citron and specialty citrus. I was given a small Meyer lemon tree with a fruit on it. The tree came bare rooted and I potted it according to the instructions on it. When the small lemon was finally ripened and came off, the tree died. I was so disappointed. The lemon is still in the fridge. I might cut it open and try to start again from the seeds. I do have a couple of miniature, probably ornamental orange trees in my kitchen. One is less than a year old and growing nicely–started from a fallen orange of the older very large tree, in the dirt. The older tree is over 30 years old and has moved with us. It is potted and stays inside for about 8 months and goes outside to the deck in May. I also had had a grapefruit tree started from the seeds of a fruit—there were small roots on a seed and I couldn’t just toss them. It had grown quite large, but died in a move. I hope to start again. Hey there David! Thank you for the wonderful post. I have a lot of the citrus you mentioned growing in pots. My super dwarf varigated lemon was in a pot until a few years ago when I into my “baby house” with a “baby yard” (aka, teeny tiny). I have a Meyer lemon and key lime in pots as well. I just purchased an Australian lime and a yuzu (yes, both in pots in my tiny yard). Citrus does very well in pots and it doesn’t take up a lot of space. Did you know that a yuzu can take cold a lot more than other citrus? So grow a super dwarf lemon in a pot in your apartment. It truly won’t take up a lot of space and the smell of the blossoms is worth it (as is the fruit)! BTW, I just got a bag of the Cara Mia oranges a Trader Joe’s. Delicious! Oh, and I can send you those candy covered chocolate sun flower seeds anytime you would like. Thanks again for a wonderful post. Love the pictures and that rice wafer machine IS scary! I love this post….I’m from Florida and now have a Meyer lemon tree in my backyard! David, I’m a subscriber with a technical question….could you kindly tell me how you got feedburner to deliver your e-mails with a photo and link to your website to read the rest of the story. I can’t figure out how to have a photo delivered too….only words show up in my e-mails to subscribers when I have them click to my website to read more (I’d like a photo to hook them) Thank you for any advice you could give me! Thank you for this educational post! I wanted to mention my inspiration for finding yuzu. I used to work at The Mark restaurant in NYC where, on top of offering creative cocktails, they also served a few “house sodas.” This place had a yuzu house soda that was to die for, and I’ve always wanted to experiment with yuzus (and ginger, I believe) to try to recreate it. Hi Lisa: I’m not too brilliant with how that stuff works and I have some web folks that handle anything around here that’s not lemon or chocolate-related! If you’re on WordPress it’s a Feedburner plug-in that can be tweaked to send out your feed, but that’s as much as I know. Alexandra: It’s likely they were using that bottled juice which you can find in Asian markets that specialize in Japanese foodstuffs, but perhaps they used fresh? Good luck with your experiments. What a wild event to participate in. I appreciate the sharing as I have not heard of some of these fruits either. I get as excited as you when I actually get to see and taste something I have heard of for the first time. I live to travel! My heart skipped a beat when I saw this post. My husband and I moved from Dallas to Paris this week and it was such a pleasure to see the familiar produce signs at my beloved CM. I was just using fresh squeezed blood oranges from the citrus fest to make margaritas for my family a few weeks ago :) Your blog has been a real life saver for a Texan finding their way around this beautiful city. Thank you for all the help and the wonderful post about your visit to Central Market! Great write up, David. In the Philippines, we have, what I thought/think, is a citrus fruit called “kalamansi,” which I just learned is similar to a calamundin. It tastes fantastic as a juice in the summer. one of my favourite posts..citrus does brighten everything! i missed two interesting citrus…kalamansi lime and keffir lime(well..more for leaves than the juice..anyways). I nearly bought a pink lemon tree a couple of years ago. Although you mentioned rangpur oranges- and they’re definitely unique, I’d also like to introduce readers to orange jasmine. This is also a citrus variety that is unknown in North America but is cultivated in India and Australia, of all places. 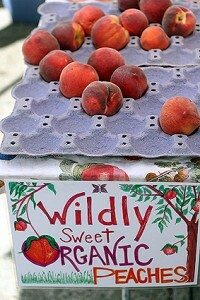 The fruits are very small, just a few inches wide, but that’s what makes them worth the wait. I definitely hope you have a chance to visit India and try them someday. This is an amazing post! I learned so much about citrus fruits. Thank you for the thorough education. This also made me miss Central Market in Dallas SO much! I could spend hours in that store (and often did when I lived there). Not only is everyone friendly and knowledgeable, but the entire produce section is like eye candy! I just love it. I honestly can’t believe that there aren’t other stores like it anywhere else (at least that I have seen in big cities such as NYC or DC). I have major citrus envy. The UK just hasn’t taken citrus into her heart in the way the rest of Europe has. Though we do love a bit of marmalade and incidentally marmalade ice cream is really rather divine, if a little odd tasting due to that whole citrus bite and creamy combo. Mmmmm. Thanks for a great post, David. I know, it’s a strange concept, but large Sicilian lemons with their thick mild pith and relatively sweet flesh really do taste great sprinkled with salt. A bit like a Margarita sans tequila. The yellow rind needs to be sliced off thinly though as that’s the only bitter part. They are often sold in markets or on the roadside in Sicily, quartered and sprinkled with salt and make a lovely refreshment on hot days. Unfortunately I haven’t been able to get hold of that particular variety in the UK yet and I can’t find a Buddha’s Hand either, not even at Whole Foods in London. My son and I did a scallop cookery course today and the perfect end to the meal was panna cotta with blood orange compote and blood orange and campari sorbet. Once upon a time, I bought blood oranges from the supermarket. No taste to them at all. This discouraged me from ever buying them again. Fabulous, interesting post. I hope you meet a Cara Cara soon. Thanks again, David, for an excellent post. Oh to go citrus nibbling around the world. My garden delight is my satsuma tangerine, navel orange, valencia orange and eureka lemon. They are all extremely happy in their location and have full but mellow flavors, so I eat/drink dozens of navels a week right now – really. When they are tree ripened they are not acidic and because I water mine heavily, they are very juicy. My eureka lemons are not the stuff that eats the enamel off your teeth, but actually taste of the lemon blossom. They are so large people have mistaken them for grapefruit. I wonder if the finger lime would grow well in Modesto, CA. If anyone can stand me after all that boasting, maybe they could give me a suggestion.for the open space that could accommodate one more citrus tree. I, too, find Meyer lemons quite boring. The flesh is not tasty and the rinds do nothing for lemon curd or lemon merengue pie – so none of them, thank you :-). Wish I could share my bounty with you all. Norine: I like Meyer lemons, but there are certainly other lemons (like these pink ones) that don’t get the press, but are lovely. I did make some lemon bars with Meyer lemons once and they just didn’t have the same pucky oomph I want from a lemon bar. Andrea: Yes, I can imagine lemons sprinkled with salt (or sugar) but citrons, I’m not so sure about. Perhaps it was a mis-translation when I saw them in an Italian cookbook, the recipe said “Citrons” but I was in Italy once and saw a citron tree and they were insisting them were regular lemons–although they said, “They’re too tough to eat”, which made me think I was right. But since it was their tree, I took their word for it. Brooke: There isn’t anything else like it that I’ve seen. Whole Foods is possibly the closest equivalent and when we were in New York a while back I took my partner (who is Parisian) to Whole Foods and he was stunned, and said, “Why don’t we have anything like this at home?” (especially the take-out). I think it’s because a lot of that stuff just isn’t easily available and Central Market takes the time to cultivate contacts and forage for all this citrus, which is why it’s such a great supermarket. I just started following your blog and love the food and beautiful pictures. I recently found your website while looking for a good Baba Ganoush recipe. I’m actually trying to locate your post on food blogging, which showed last week up in partial form (several short opening paragraphs and then the “read more” link) in my rss feed email box, but I keep ending up on the merde! page. I’m a newbie and wanted to read your tips. Thanks for your help and wisdom! I just returned from a trip through Cambodia and Laos where pomello fruits are very common. We often had a lovely spicy pomello salad for lunch or dinner. The pomello sections were shredded into tiny bits and mixed with peanuts, mint, lime and tiny shrimp…delicious and perfect to counter the hot and humid weather. I assume the Korean wafers (I don’t know if you’re avoiding a brand name on purpose) are the same things I’m getting here in Westchester. They’re like big rice cakes, only a million times better and they come shooting out of the machine, one at a time. Next time you’re in Westchester or Connecticut, you can get them at the Fairway in Pelham or Stamford. Maybe some of the other Fairways, too. I don’t know. I’m extremely happy that you enjoyed Texas and Central Market, which is my most favorite store EVER. I spend hours on hours in there gawking at the chocolates and very thorough and large range of quality, and usually natural or organic, food. They have everything, I swear. Magic Pop, the rice cakes I assume you’re talking about because I get some in Central Market (and CM’s mother H-E-B), are amazing as well. I eat them without dip, though you can, because they’re so light and crisp with the sweet, subtle corn and rice flavor. Marcia: I wasn’t not mentioning the name of the machine; I just didn’t recall what it was. Fortunately a reader pointed it out and I found a video link and inserted it into the post so folks could see for themselves. I think they were good, but would like to see them flavored with some seaweed or something to give them a little zip. Still, I found that oddly appealing nonetheless. In spite of the scary noise. Wow never knew there were so many varieties of citrus. Want to try them all. Had the opportunity to visit San Antonio several times and fell in love with Central Market. Have never found place better. What a great write up on all of the varieties of citrus. We too were asked to be at the Citrus Fest since we grow all these varieties and supply Central Markets with them. We made sure someone from our farms was there so that the consumers could meet the people who are actually growing what they are bringing into their homes. We applaud the chefs who use these unique varieties in their cuisine, enticing diners to go out and buy some for their table. 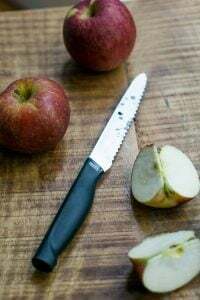 Those who write about these varieties offer the consumers the knowledge they need to feel comfortable experimenting with a new piece of fruit, encouraging them to try something new. 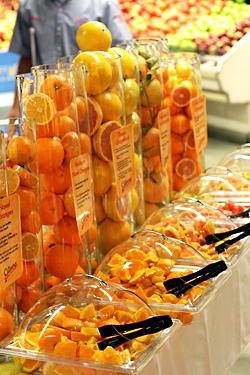 The innovative produce departments such as Central Markets enable customers to indulge in many wonderful experiences. It’s those of us who plant the tree’s after we have investigated new varieties and then wait years for them to produce fruit, who sometime’s get forgotten in this circle. We farm on a very small scale, but love to grow a very large range of citrus. It’s not the stores themselves or the large produce brokers that nurture these crops to fruition. So keep on writing about how wonderful these citrus varieties are and meanwhile – back at the ranch – we’ll do our part to produce the best tasting fruit possible. Hi Kim: Thanks for growing and providing all that lovely citrus! 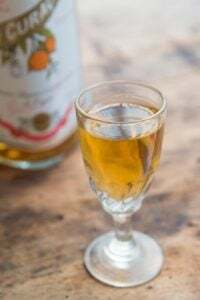 It can’t be easy (although I’m sure it’s very rewarding) raising all these varieties of citrus that folks aren’t familiar with–and getting them to try something new and unusual can be a bit of a challenge. Appreciate all the work that small-scale farmers do and thanks again! I LOVE Central Market and I’m so lucky to have one nearby. Have you heard their radio commercials? They are full of witty food puns and absolutely hilarious. The Chocolate festival is going on right now.